So today I took a small amount of time to try one of my Next boards for the first time. I have 2 boards now as I obtained one from a Dutch person this week. That way I can leave my brand new one unopened for now. The complete unopened board is actually offered on eBay. The board looks awesome! I’m really looking forward to getting it working. 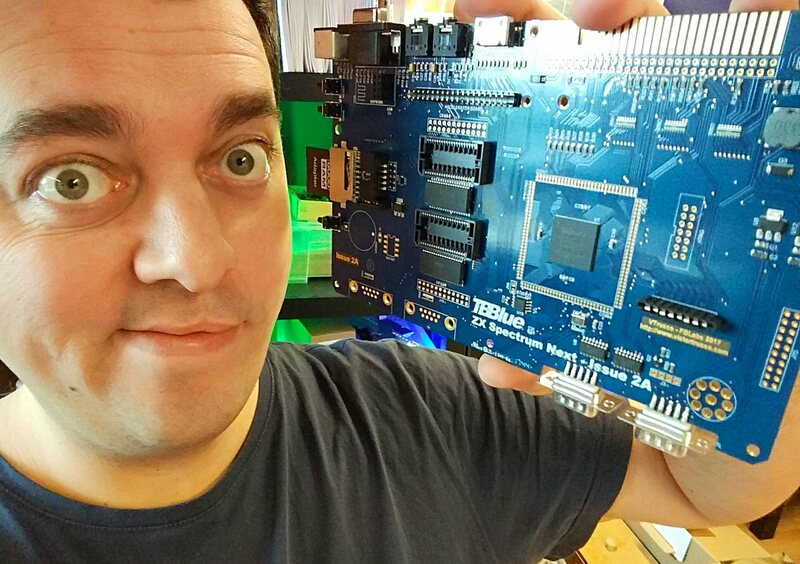 My main reason to have a Next is to check if my hardware (check the webshop) is compatible. But I also like it a lot that this new product was developed by the awesome team with Henrique, Victor, Jim, Rick and others. I met Jim and Rick in October at Spectrum35 and was facinated with their talks and from the others. I’ve also been in contact with Henrique, and really think he’s done an awesome job with the whole project so far. There doesn’t seem to be a ‘getting started page’?! There is this ‘Instructions for the 2A Next board‘ page on the Next website, but it’s not really a follow-through-and-you’re-running. I am a bit of a lazy reader, so please forgive me if I missed some on that website. The Next website has some more sources, but nowhere is there a complete proper guide for new users at this moment (Feb 2018). It was unclear if I had to use a standard 9V PSU or a ZX Spectrum one. My guess was only either one of those as there is no bridge rectifier on the board. At the end I found some info in the FAQ: standard 9V PSU with positive center pin. I selected a proper 9V 3A PSU, though 2A is enough already. With my first power up, HDMI was low-res, not full size and picture is shaky. Without an SD card it showed an error message, which is good as I see can something at all, knowing the board is working. I plugged in VGA, but no output there yet: the TV showed the input was incompatible, so probably some config is needed on the Next board. I browsed the Next website and found NextOS v0.8; hope NextOS the correct name for the distribution: there are several names, which will make it a bit unclear to some. I took a 2GB SD card and put the files on it, then inserted it into the SD card slot of the Next board, and.. So I looked for another version of the NextOS files, and found v0.3. Tried that and! More black nothingness. Then I grabbed a DivMMC EnJOY! SD card (as I sell those I have plenty) and put that in to see what happens. Hey, a different error message! So my guess was that the 2GB card is incompatible. Strange. But hey. So I formatted that (8GB) card, put NextOS v0.8 on it and, voila, it boots! A nice NextOS menu on screen. I guess the TBBlue will not work correctly on the Next, but I wonder why it is on the Next website then, and not on a dedicated TBBlue website. There is also no info on both pages for which hardware it specifically is. 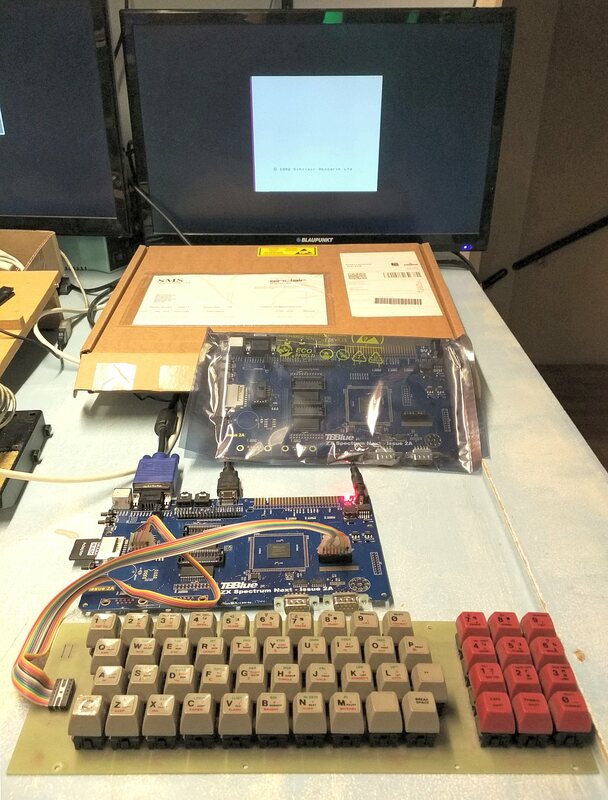 I plugged in a ZX Spectrum keyboard (a DK’Tronics one I use for testing, ugly but a tough guy). Ok, let’s press a key. Yes, I pressed a key. D*m**t, I pressed a key! Ok, let’s try a keyboard membrane. Nothing. Let’s see if I have a PS/2 keyboard laying around: (looks around) nope – all packed for construction works at ByteDelight HQ that start next week. Ok, maybe I could press SPACE on the DK’Tronics thinhy when the message appears during boot. Yes! It responds! I get another screen with options. So first let’s see if pressing E can have the VGA output get to life. And yes: that works now. Next is to select a machine, 128K for me, and check options like sound output, DivMMC enabled, etc. Now I get an ESXDOS.ROM error. Ok, let’s google for that (since I didn’t come across that in the non-existing Getting Started guide). I need to rename a file (why??)? Ok, let’s do that. Getting less easy for some now I can imagine.. Yes, it fires up ESXDOS. More error messages. Let’s read that page again I cisited a minute ago: ah, I need to copy the ESXDOS files myself to the SD card. Some may have given up at this point. Ok, copied ESXDOS 0.8.5 files. Errors. I needed to copy only the files in the ESXDOS SYS folder to the new sys folder? Ok.
Ah, the ESXDOS 0.8.6 ROM is installed on NextOS. Ok, I’ll copy the 0.8.6. files – which isn’t easy as the ESXDOS website does not show the v0.8.6 files anymore (they were there in the past). I have them if anyone needs them. Let’s press the ‘M1’ button. Nothing happens. Let’s press the ‘DRIVE’ button. 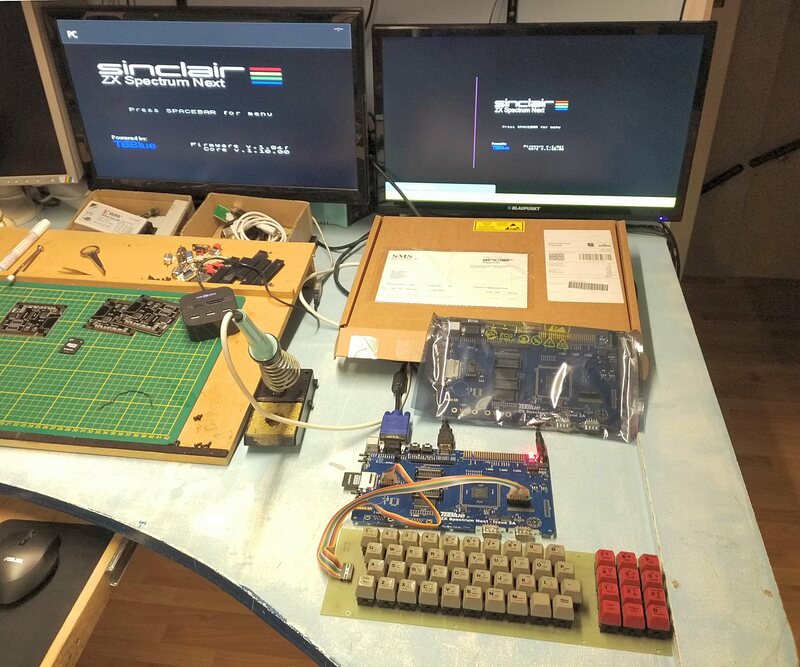 The ZX Spectrum (ROM) resets. Let’s give it a rest. Will be back later! See the above note about the 2 different distributions for the Next and for TBBlue. I think I downloaded the TBBlue one, so will try again with the Next distribution asap.